Daler Rowney publicity DVD for the relaunch of System 3 Acrylics entitled 'Lay it on Thick, Spread it on Thin'. The DVD comes free with certain packs of System 3 paint and is available from Amazon. 'Vibrant Acrylics' is the accompanying DVD for Hash's first book and contains several step by step demonstrations. Copies are available from Amazon or as a book and DVD set from the Society for All Artists. Two of the four paintings completed for the relaunch of System 3 acrylic. 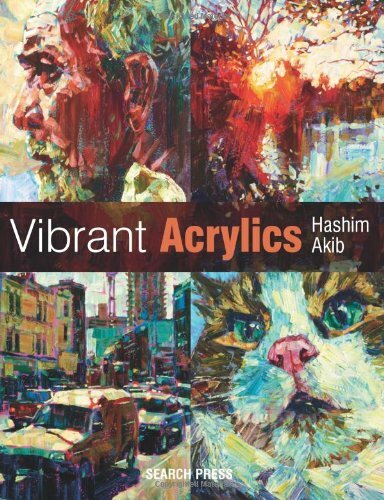 Hashim's first book entitled 'Vibrant Acrylics' published by Search Press was released in 2012. 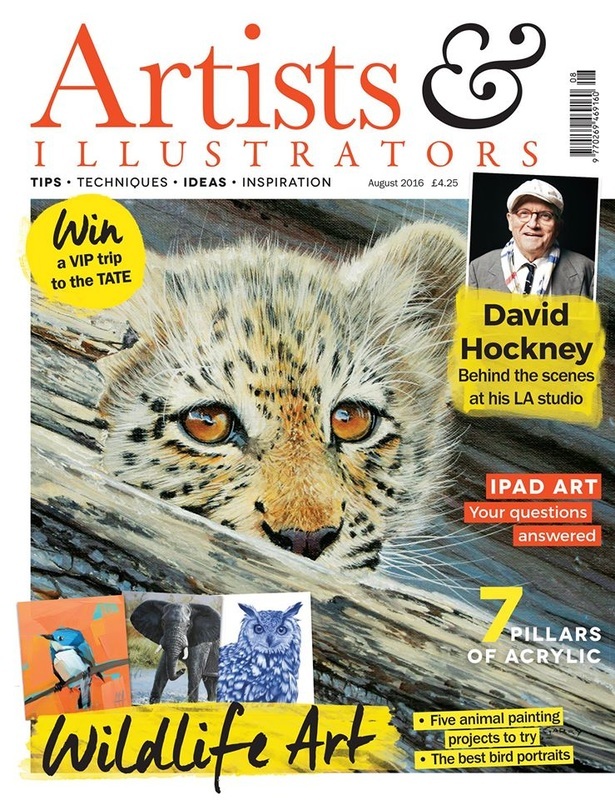 He was a co author and designed the Acrylics section in the 2016 publication of 'Artist's Painting Techniques' by Dorling Kindersley. Inclusion in 'Who's Who in Art' came in 2015. 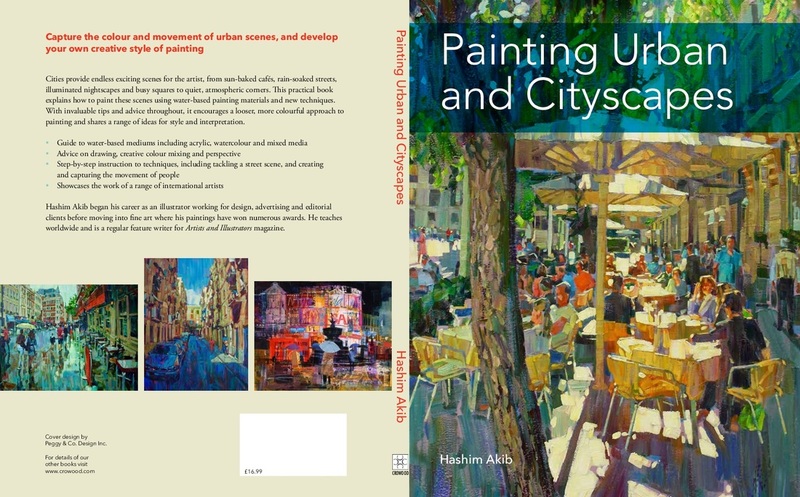 New for 2017 is a new publication entitled 'Painting Urban and Cityscapes' published by Crowood Press. Hashim has been a contributor to various magazines including as a regular feature writer for the 'Artists and Illustrators' magazine. I recently interviewed Hashim Akib by correspondence. Jim Powers: Hashim, when did you become interested in art? Hashim: I’ve always been interested in art or creating something. As a child I was either drawing, painting or making clay models. I guess the habit just stuck and it expanded to watching, reading and experiencing any creative process. I think it’s inspiring watching someone or a group of performers do something well with mastery. Even listening to individuals talk with passion about a subject is uplifting, a scientist excited over a new discovery or a chef discussing the best way to cook turnips. Is art a “spiritual” experience for you? I look at it more as a ‘workout’ for the mind. Did you go to art school? How did it prepare you for a life as an artist? How did it not prepare you? I could go on and on about this, I found art school a completely demoralizing experience. Basically the best education to becoming a full-time artist is on-the-job experience, dealing with clients, finding ways to create cash flow, working to a deadline, all this before the luxury of creating something even comes into it. There are lots of different avenues to go down from government art awards, illustration, teaching, demonstrating, commissions, selling art through galleries or online, none of which were even discussed at college. How long did it take you before you felt like you could call yourself an artist? Was that a long and hard transition to make or was it a quick one? 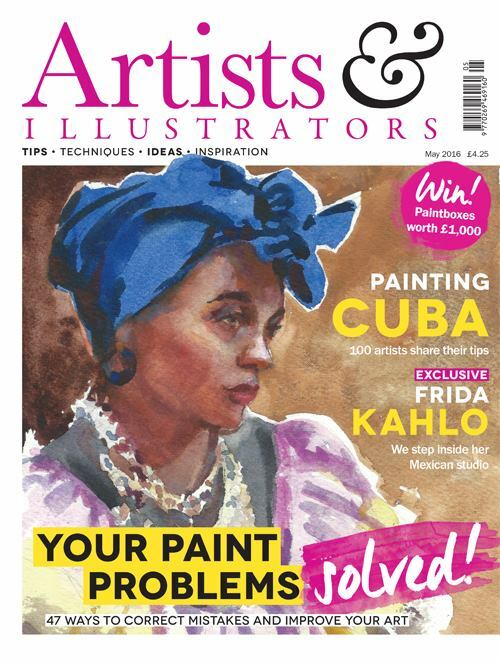 Do you think it's important for artists to call themselves artists? I always feel a bit strange saying I’m an artist, a mechanic can say he’s an artist but I’m certainly no mechanic. I guess if you’re being paid for your creative efforts you gain some kind of right on the title, then again Van Gogh only sold one painting. My only other job ever was an afternoon working at MacDonald’s and that pretty much sealed the deal for a career in art. I worked as an illustrator initially and a stint as a part time lecturer in Art at the local University and Adult college. In the mean time I was still painting until I could set up my own workshops and started doing commissions and gained gallery representation. How did you approach learning to paint? 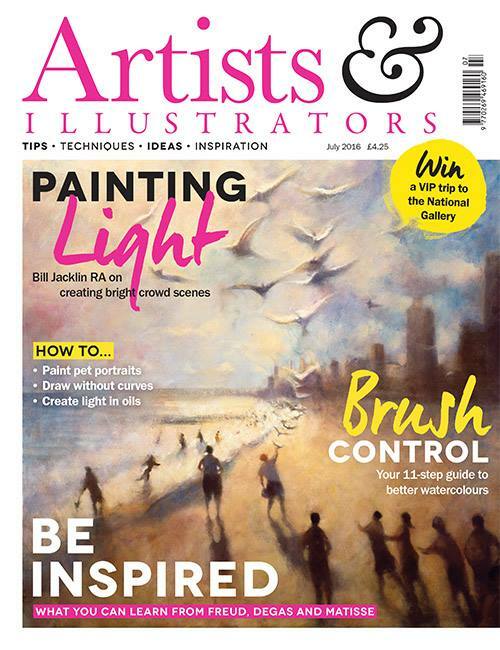 What advice would you give about self-teaching to someone who wants to learn to paint? I read lots of books on painting like the old masters, color theory, art history and watched a ton of art DVDs. If you’re learning to paint, it’s incredibly useful knowing a bit about art history and art movements just to have some reference points in your mind. This way you can relate it to changes in your paintings or how your own work is evolving. Most people start off technically before really letting go with paint. Oh and you need to practice loads! How much time do you spend painting now? I paint most days in between answering emails, doing admin and writing articles. Always Acrylics! I have invested in a load of Oil Paint and Spray Cans so look forward to trying them out soon. What type of images move you to paint? Do you paint from reference photos, from memory? How do you approach a piece? For example, do you work through thumbnails before beginning or do you go directly to the page? I really love painting street scenes with crowds and strong sunlight, generally from my own photos. There is very little preliminary drawing or thumbnails, its straight in with paint and my largest brushes. The concentration it takes to draw refined detail is really draining and throughout the course of a painting I’m trying to maintain my initial excitement for the image. Any fussy brush work or definition happens at the latter stages and even then it’s severely restricted to keep the energy of the paint alive. I work on three or four paintings at any one time, I’m really working off my enthusiasm for each scene and when things lose their momentum or I’m allowing areas to dry I’ll move on to the next. These are quite intense painting days but the work never gets dull or boring. How do you know when to quit (a painting)? I use to work in a very laborious way and spent a month or two on each painting. I used tiny brushes and worked in a very traditional manner. This went on for years and it was really out of the need to make money that I started speeding up and using the largest flat brushes I could find. I limited each painting to two or three days completion time and I just edited out as much unnecessary detail as I could. To my surprise the work starting selling consistently and my blocky, colorful style was established. How important do you think it is to have a particular style as an artist? How does it play in the marketability of your work? It’s vital to have a style which is all your own, most exhibition goers leave a show with a general impression of your work. Having multiple styles or themes can confuse what message or thread you are trying to convey. Once you've established a style then it’s slightly easier to move around the boundaries. The other extreme is sticking with the same style for twenty years and never changing. This leads to your work becoming out dated. You have to be willing to leave your ‘comfort zone’. How do you market your art? Do you have any advice for other artists about what has worked and not worked for you? I sell my work through a few galleries, they take 50% commission but they have a long client list of regular and serious art buyers. Being in a gallery means I’m also showing with highly regarded artists and any haggling over prices of artwork is left to someone else. I also have a website www.hashimakib.com and Facebook page Hash Art, the latter having very little financial return other than the kudos of getting a couple of ‘Likes’. I do demonstrate my techniques around the country to various art groups which is great for generating interest in workshops or commissions. The old “word of mouth” system still tops most marketing tools if you have an interesting service of products to sell. 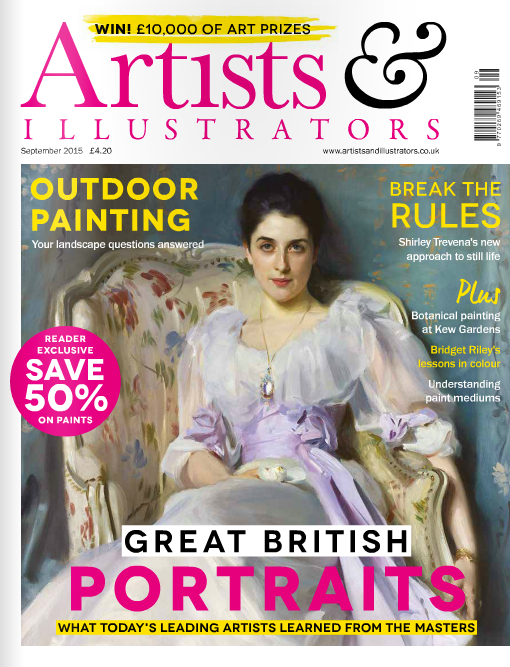 I also write for various magazines which showcase my work and keep me in the public eye. Lastly I try to enter Society Art Shows. Again, when you exhibit with respected artists it elevates your work. Currently I run a couple of workshops from my studio a month, a week’s workshop in Italy and a couple of weeks in France during the summer. Anymore and there would be little time for painting. Where do you see your art taking you in the next 5 to 10 years? Any hopes and dreams? I’m finding myself drawn to abstracts more and more, just how colors work, spontaneous brush marks and generally less reliance on detailed elements. I would imagine in ten years time my work will just consist of multiple drags of color. At the very least I hope I’m still enjoying the processes and discovering new artistic and creative horizons. In closing, what one or two pieces of advice would you like to give to newer artists? Be motivated and don’t lose your sense of humor, you’ll need it.